Though avoiding sea turtles is preferable—of course you want to save your bait for tuna and your time for fishing!—you will inevitably encounter some hooked or tangled turtles. With a few tools, quick action, and some helpful techniques, you can ensure that the turtle has its best chance at survival. As soon as you see a hooked or entangled turtle, bring the boat to a stop (if you are not stopped already) while releasing tension on the mainline. Using constant pressure, pull the branchline in gently to bring the turtle alongside the vessel. Never use a gaff or other sharp object to handle a turtle. You must make a decision about whether to bring the turtle on board, which will be influenced by the size of the turtle and the conditions at sea. Gear removal is easier if a turtle can be brought on board, but if for size or safety reasons it is not practical to bring the turtle on board, assess the placement of the hook and remove the gear using the appropriate long-handled dehooking device. Do not pull on the line of a deeply hooked turtle; this will only cause further injury. 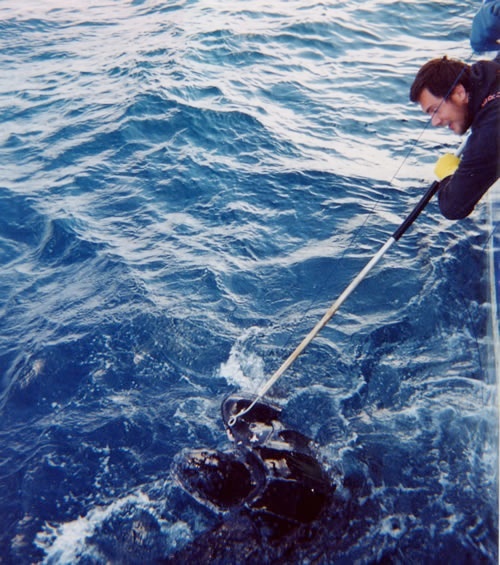 Often, help from a crew member is needed to maneuver the turtle and operate the dehooker. If you are able bring a turtle on board, assess its general health and determine whether it is deeply or lightly hooked. When handling, do not lift the turtle by its flippers or use sharp objects (e.g., gaffs) to bring it aboard. An active turtle can be placed on a tire or similar platform to immobilize it. The hook’s barb is not clearly visible. In these situations, use line cutters to cut the line as close to the hook as possible. If you can, use bolt cutters to cut the hook near the barb or the eye and then pull it out. Remember—disentanglement at the earliest possible stage maximizes a turtle’s chance at survival!